Copyright law aims to achieve a balance between the interests of creators (so they receive a reward for their works) and the public interest in terms of ensuring the public has access to such works. Legal flexibilities in Copyright - known as limitations and exceptions - provide balance between users and creators of protected works. Libraries, Archives and other communities - - involved in providing public Information & Knowledge & Data Management services - - need both international Copyright norms, and their Limitations and Exceptions, to provide access to knowledge and preserve our cultural and scientific heritage (Access and Preservation). According to a WIPO's Magazine article "Copyright exceptions: an archivist’s perspective", Archives, Libraries, Museums and other "alliances"
To ensure that digital holdings remain accessible, it is standard practice for different communities of practice to copy works from proprietary formats to open standard formats, or to copy records to newer versions of software. The Internet provides exciting opportunities for archives, libraries and museums to make their holdings available to a wider research audience, by digitizing them and making them available online. For example, when copies are sent to a country where the copyright law differs or where the copy does not meet national requirements. A solution could simply involve all countries recognizing the legitimacy of a copy lawfully made by an archive/library/repository in another country. As thousands of rights holders are not known or cannot be located, archives/libraries need an exception that makes it possible to make orphan works legally available without a costly (and in many cases fruitless) search. Archivists choose only holdings in which they own the copyright or in which the copyright has expired. A limit on liability would enhance the range of online offerings and enable archivists to better fulfill their public interest mission. The WIPO Internet treaties (the WIPO Copyright Treaty and the WIPO Performances and Phonograms Treaty) require signatories to amend their copyright legislation to prohibit the circumvention of technological protection measures (TPMs). The trities are intended to ensure that rightholders can effectively use technology (e.g., Digital rights management, DRM) to protect their rights and to license their works online. If the vendor providing cloud storage for their digital holdings is located in another jurisdiction, the cloud storage provider may fail to comply with the copyright laws of the repository’s jurisdiction. Contractual overrides completely nullify the purpose of the exceptions. 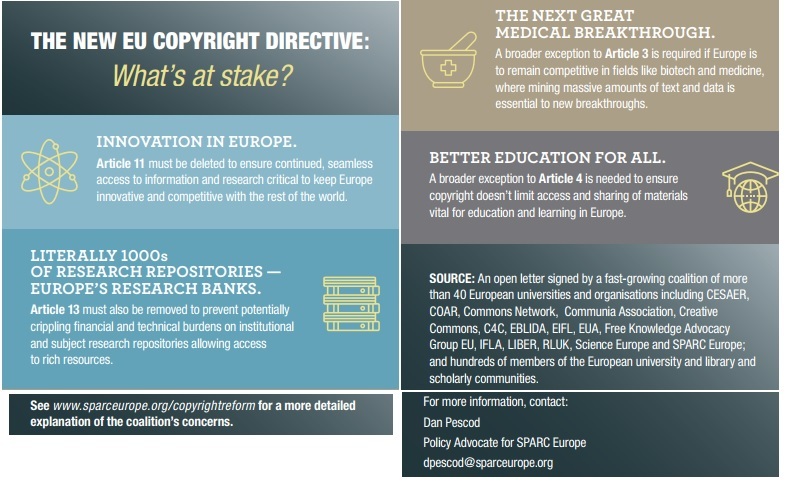 All in all, in order to fulfil their public (& cross-border) service mission in a globalized world, - different communities of practice need COPYRIGHT LIMITATIONS & EXCEPTIONS. Learn about the current discussions around libraries at the World Intellectual Property Organisation. WIPO’s Standing Committee on Copyright and Related rights (SCCR) is currently discussing exceptions and limitations to copyright for libraries and archives. Learn more about the Development and Access to Information (DA2I) 2017 Report launched (in 2017) by IFLA in partnership with TASCHA at the United Nations High Level Political Forum (HLPF). Coordinated by the European Alliance for Research Excellence, twenty organisations, including LIBER, have signed an open letter to European lawmakers calling for changes to a proposed Text and Data Mining exception. A quick, but in-depth look at important concerns surrounding the use of copyright-protected content within an academic environment. Learn how RightsLink for Open Access leverages manuscript metadata to generate offer emails; order and shipment confirmations; and invoices. This expert panel and CCC look forward to sharing real-life advice for dealing with pain points in today’s Open Access workflow. #DataAnalytics, #copyrightreform hashtags on Twitter and stay tuned to find out more !